What’s the most common complaint for people clicking on a web site? It loads too slow! Well AMP is looking to change all that by creating a master library of java scripts that will avoid constant re-loads among other things. It’s an open platform and sites using it do load very fast. But is there an issue with AMP being Google, which is always playing the long game? Also, we discuss the top news sites that are just killing in market share, which you may never have heard of. Live streaming of our show coming soon this Friday, February 5th! Visit GrowTheDream.com/live to get notified! Facebook released new numbers last week – quarterly revenue (Q4 2015): $5.84 billion (up 52% from the year before), profits: $1.56 billion (up 122% from the year before). More importantly: Monthly Active Users: 1.59 billion, Daily Active Users: 1.04 billion. Mobile Monthlies: 1.44 billion, Mobile Dailies: 934 million. HUGE growth in mobile. 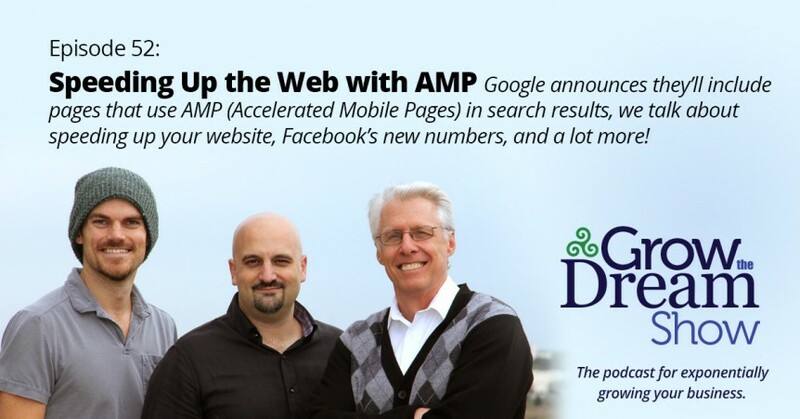 Google announces that they’re planning to incorporate AMP pages into search results, and will “reward” sites that load faster (even more than they have before) with higher rankings. Automattic has spearheaded the creation of a WordPress plugin for AMP, but it’s still very early. Josh introduces us to social media graphics tool Photype, somewhat similar to Pablo (for Buffer), but with integrated image search. Josh also introduces us to Advsise, which provides up-to-date image sizes for ads on every platform you can think of. ….and finally, Josh also introduces us to Statsbot, which will message Google Analytics info (of your choosing) directly into Slack. Follow Grow The Dream Show on Twitter!